Julian Alden Weir, Autumn Rain (1890), oil on canvas, 40.64 x 61.6 cm, Private collection. WikiArt. Although there were other American Impressionists, most of the remainder have slipped into relative obscurity. Here I will cover, a bit more briefly, three of those for whom there are still a reasonable number of good quality images freely available. 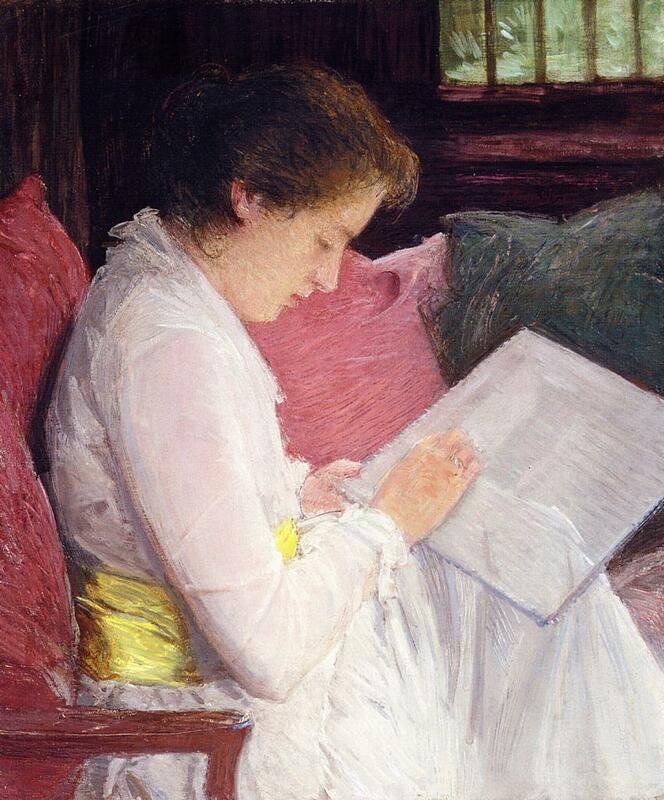 The most prominent of all American Impressionists was, of course, Mary Cassatt. However as she spent most of her career in France and is generally grouped with the other French Impressionists, I do not intend covering her work in this series. The remaining, and very prominent, painter who needs to be included is John Singer Sargent, an American who worked for most of his career in the UK, but who has left a lasting impression throughout the US, Europe, and the rest of the world. I will cover him next, before moving on to look at Australian Impressionists. Born in Irasburg, Vermont, he moved to Evansville, Wisconsin, and studied briefly in Chicago. In 1874 he attended classes in New York, at the National Academy of Design and the Art Students League, before travelling to Paris in 1876. There he was a pupil of Carolus-Duran and Gérôme at the Academie des Beaux-Arts, and had his first paintings accepted at the Paris Salon in 1877. Although only a couple of years behind John Singer Sargent, they do not appear to have been particular friends. He returned to the US in 1879, where he continued to paint in a slightly loose realist style. 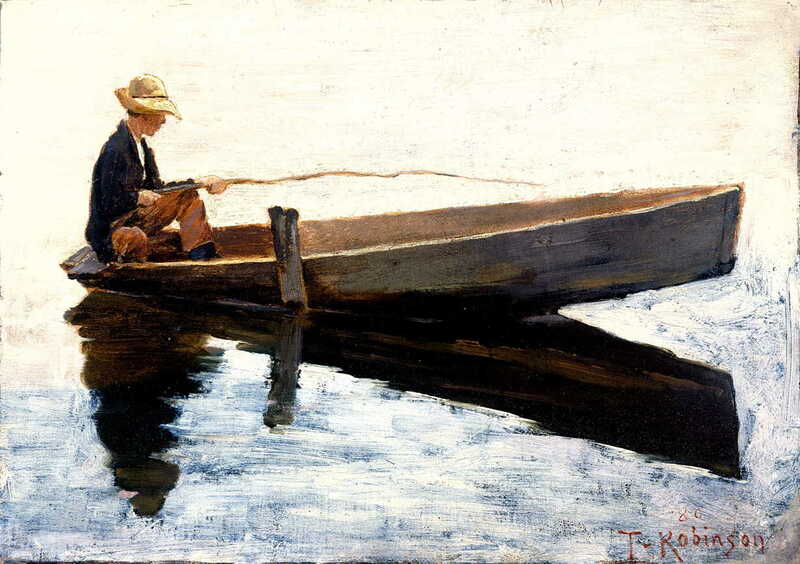 Theodore Robinson, Boy in a Boat Fishing (1880), oil on panel, 25.2 x 34.6 cm, Colby College Museum of Art, Waterville, Maine. Wikimedia Commons. In 1884 he returned to France, and based himself on Giverny, where he was one of several painters who gravitated to Monet. 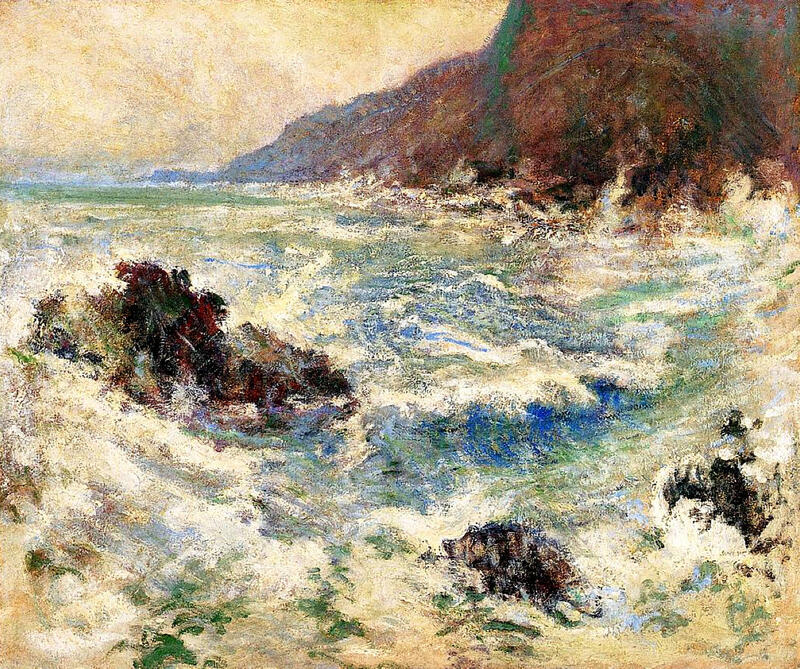 Robinson’s style rapidly became impressionist, and he became very close to Monet. 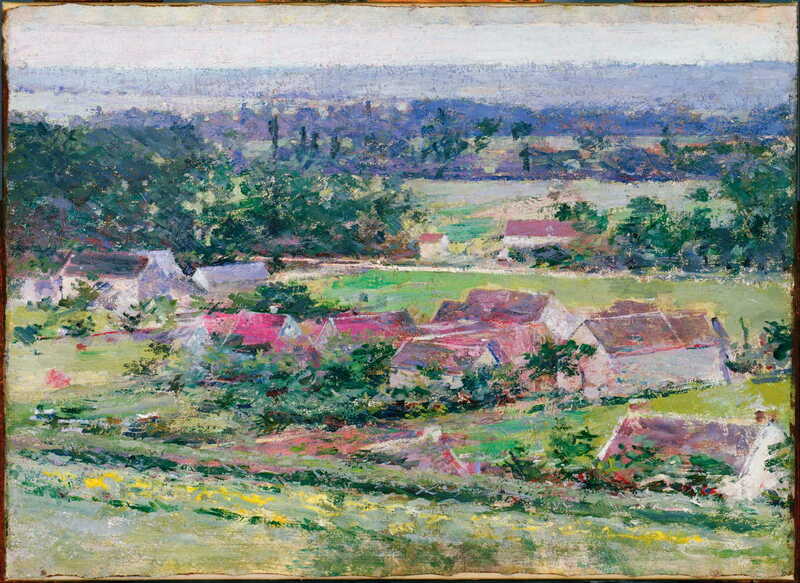 Theodore Robinson, Giverny (c 1889), oil on canvas, 40.6 x 55.9 cm, The Phillips Collection, Washington, DC. Wikimedia Commons. Theodore Robinson, The Old Bridge (1890), oil on canvas, 63.5 x 81.2 cm, Thyssen-Bornemisza Museum, Madrid. Wikimedia Commons. 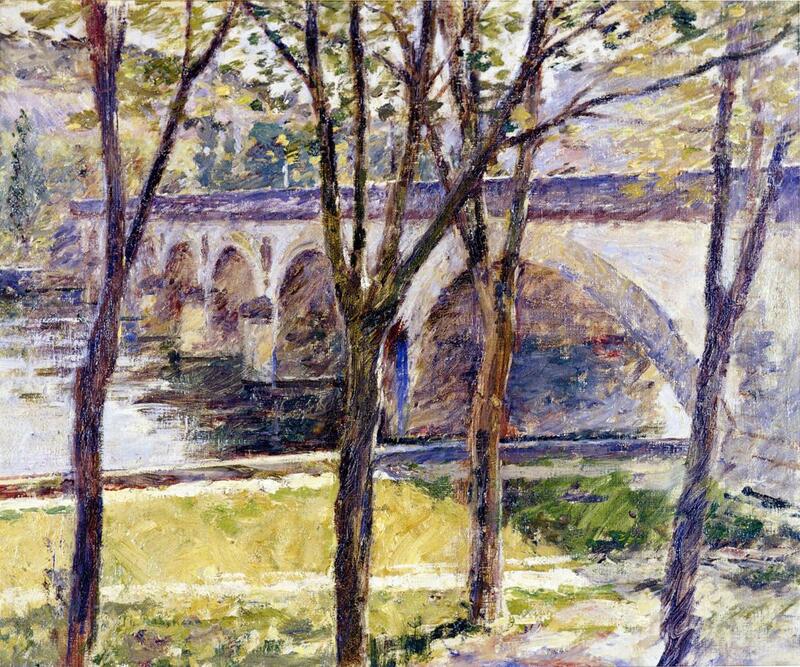 Theodore Robinson, Bridge near Giverny (c 1892), oil on canvas, 48.3 x 55.9 cm, Muskegon Museum of Art, Muskegon, MI. Wikimedia Commons. He returned to the US in 1892, where he taught at Brooklyn Art School and ran summer classes near the Catskill Mountains. 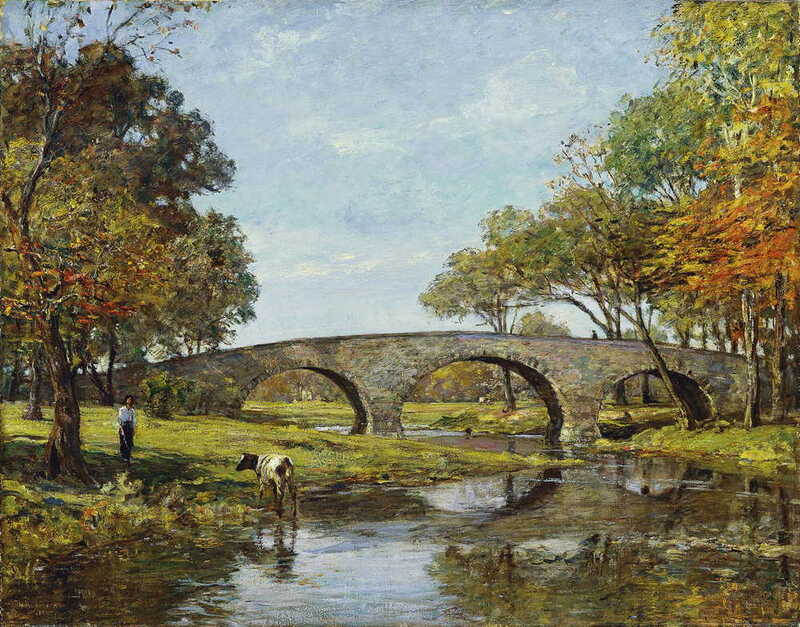 Basing himself in New York, he became close to Twachtman and Weir, painting with them at the Cos Cob Art Colony in Connecticut. In 1895 he was active in Vermont, and started to plan a return visit to France. However he died suddenly (of asthma) in 1896. 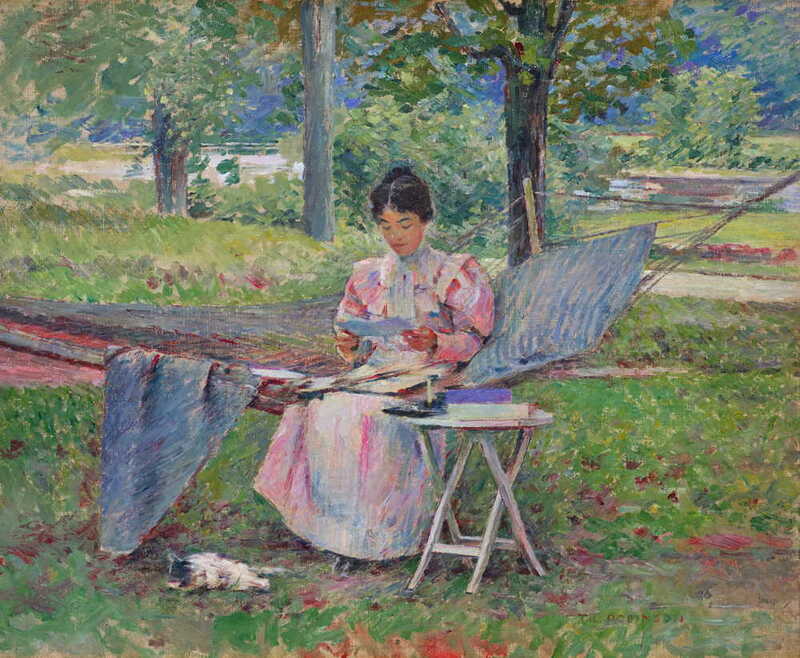 Theodore Robinson, Correspondence (1895), oil on canvas, 55.9 x 45.7 cm, Private collection. Wikimedia Commons. Robinson’s close relationship with Monet has invited comparison, which is unfair given that Robinson died so young. From his early work in the latter 1880s until his death just a decade later, Robinson was a true Impressionist, and after Monet one of the greatest painters of the area around Giverny. It is a tragedy that his career ended so early. Born in Cincinatti, Ohio, he first trained under Frank Duveneck, who had trained alongside William Merritt Chase in Munich. Twachtman travelled to Europe, studying at the Royal Academy of Fine Arts in Munich between 1875-7, where he also learned etching. 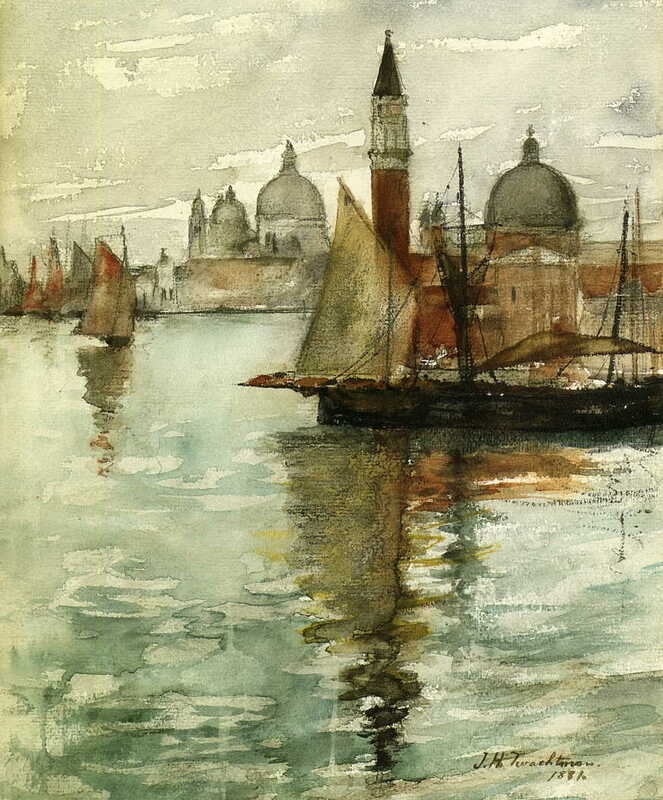 He then accompanied Duveneck and Chase to Venice in 1877. He returned to the US briefly, then studied at the Académie Julian between 1883-5. During this period he painted in a slightly loose realist style. 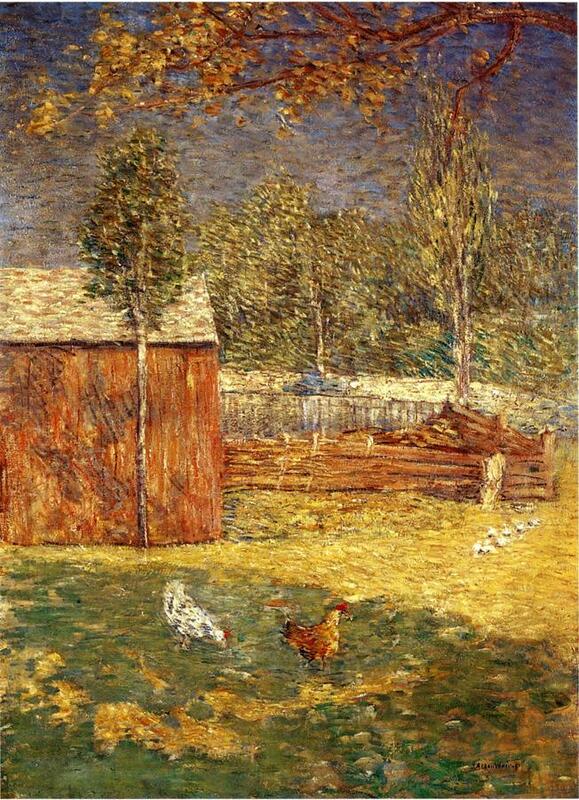 In 1886 he returned to the US and set up his studio in Connecticut, buying a farm in Greenwich. He was particularly friendly with Weir, and spent time in the Cos Cob art colony with him. Sadly he did not enjoy much success in selling his work, but was a pivotal figure in the art colony. His style shifted from realism towards impressionism, with much looser brushstrokes and higher chroma. 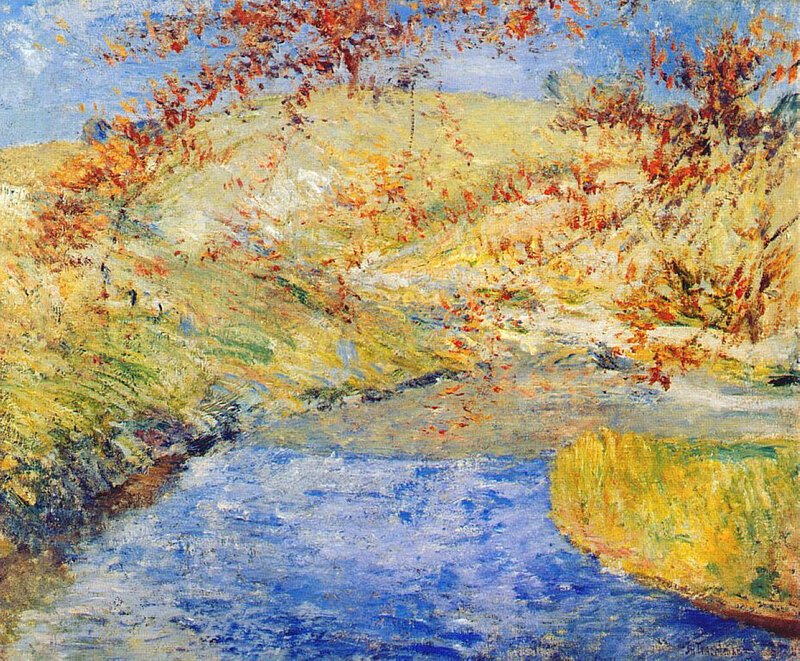 John Henry Twachtman, The Winding Brook (1887-1900), oil on canvas, 63.5 x 76.5 cm, Akron Art Museum, Akron, OH. WikiArt. John Henry Twachtman, Sea Scene (1893), oil on canvas, 84.5 x 70 cm, Delaware Art Museum, Wilmington, Delaware. WikiArt. 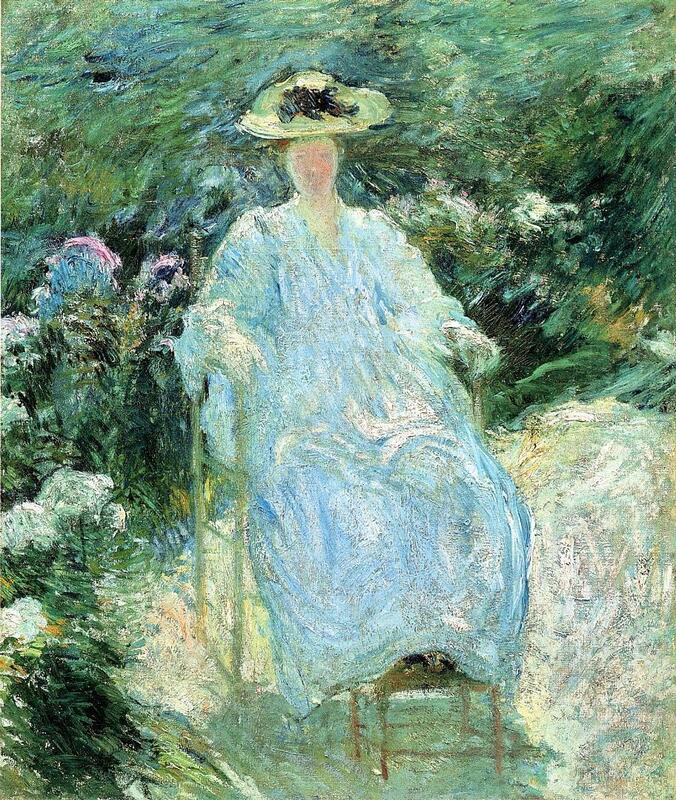 John Henry Twachtman, In the Sunlight (c 1893), oil on canvas, 76.2 x 63.5 cm, Private collection. WikiArt. 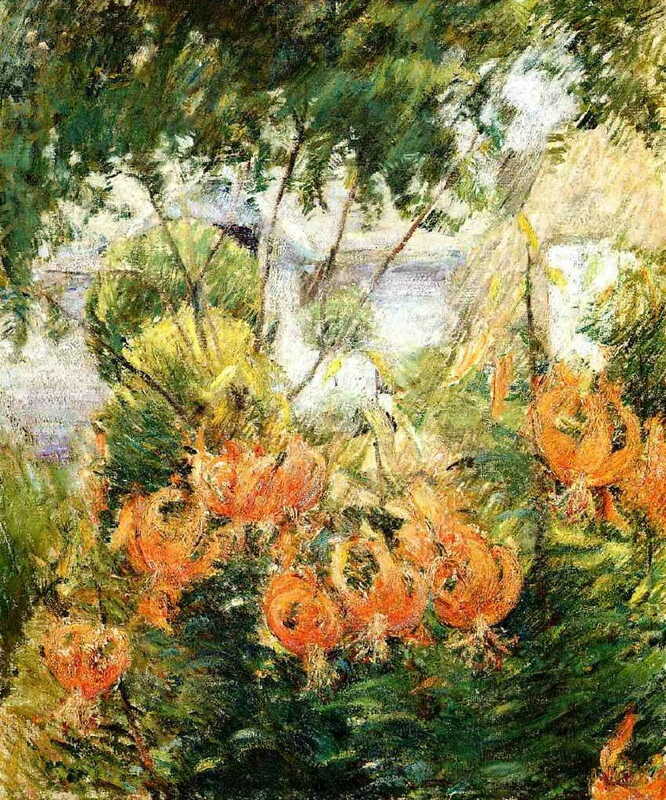 He was awarded a silver medal at the Columbian Exposition in 1893, and exhibited his work alongside that of Monet in New York. He died suddenly in 1902. 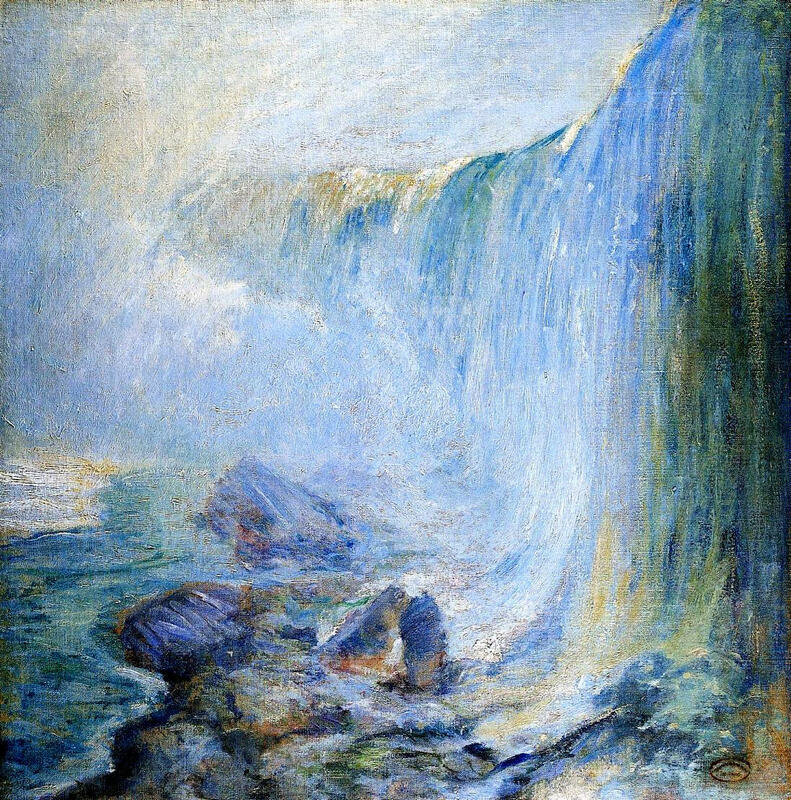 John Henry Twachtman, Niagara Falls (c 1894), oil on canvas, 76.2 x 76.2 cm, Private collection. WikiArt. 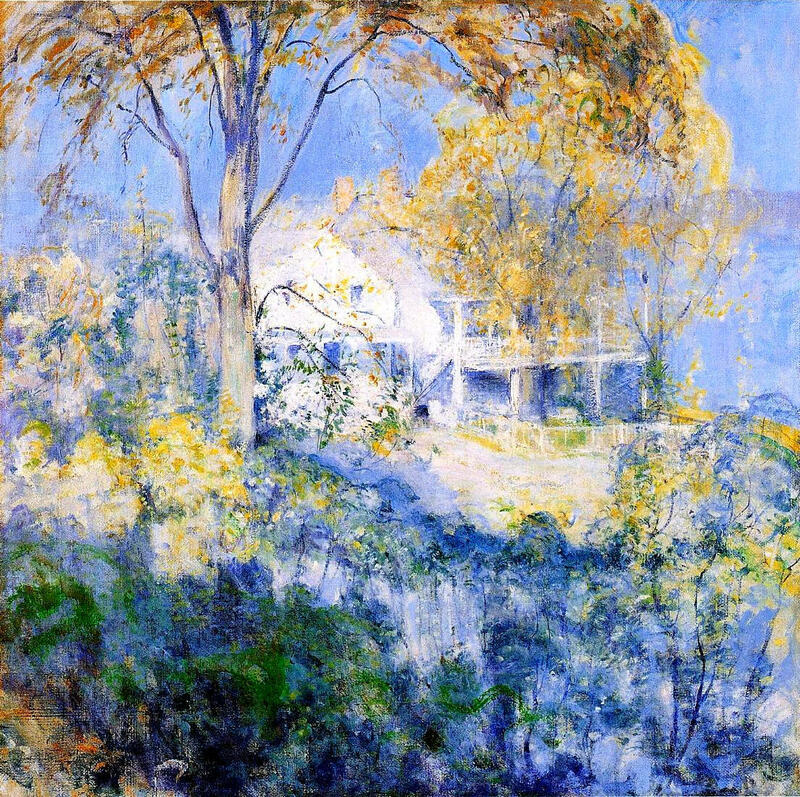 John Henry Twachtman, The Artist’s Home in Autumn, Greenwich, Connecticut (1895), oil on canvas, 64.1 x 76.8 cm, Private collection. WikiArt. John Henry Twachtman, Tiger Lilies (c 1896-9), oil on canvas, 76.2 x 63.5 cm, Private collection. WikiArt. 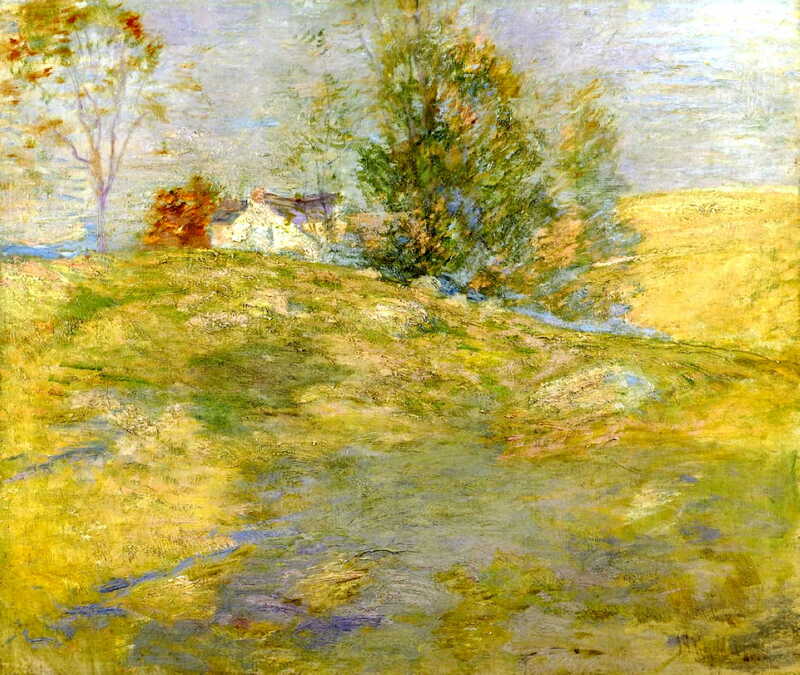 John Henry Twachtman, October (c 1901), oil on canvas, 76.2 x 76.2 cm, Chrysler Museum of Art, Norfolk, VA. WikiArt. Once he had moved to Connecticut in 1886, Twachtman was perhaps the most floridly impressionist of the American Impressionists, with very loose brushwork and colours which were often intense. As with Robinson, it is tragic that he should have died so young. Born in West Point, New York, his father was a professor of drawing at the Military Academy there, and had taught Whistler. He trained at the National Academy of Design before travelling to France and enrolling at the École des Beaux-Arts in Paris in 1873. There he studied under Gérôme, and befriended Bastien-Lepage and John Singer Sargent. At first he was repelled by Impressionism, and remained an academic realist. Before returning to New York in 1877, he met Whistler. He taught at the Cooper Union Women’s Art School, the Art Students League, and privately. Little by little his attitude towards Impressionism changed. By 1880 he was buying Manet’s paintings, and moved to Connecticut after marriage in 1883. There he became closer to Twachtman, Albert Pinkham Ryder, and Emil Carlsen, and was visited by John Singer Sargent. 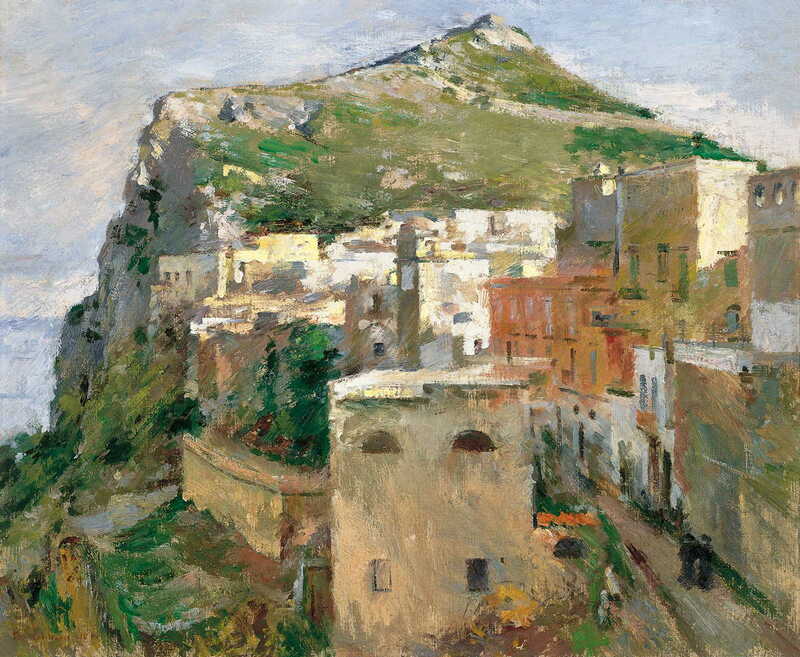 By 1891 his style had become overtly impressionist, with very loose brushwork and a light and bright palette. In 1893 his paintings were exhibited with Twachtman’s and those of Monet and Paul Besnard, in a major show at the American Art Association. Julian Alden Weir, Midday (1891), oil on canvas, 86.4 x 62.2 cm, Private collection. WikiArt. In 1897 he became a member of The Ten, and seceded from the Society of American Artists in protest at its overemphasis on Classical and Romantic Realism. 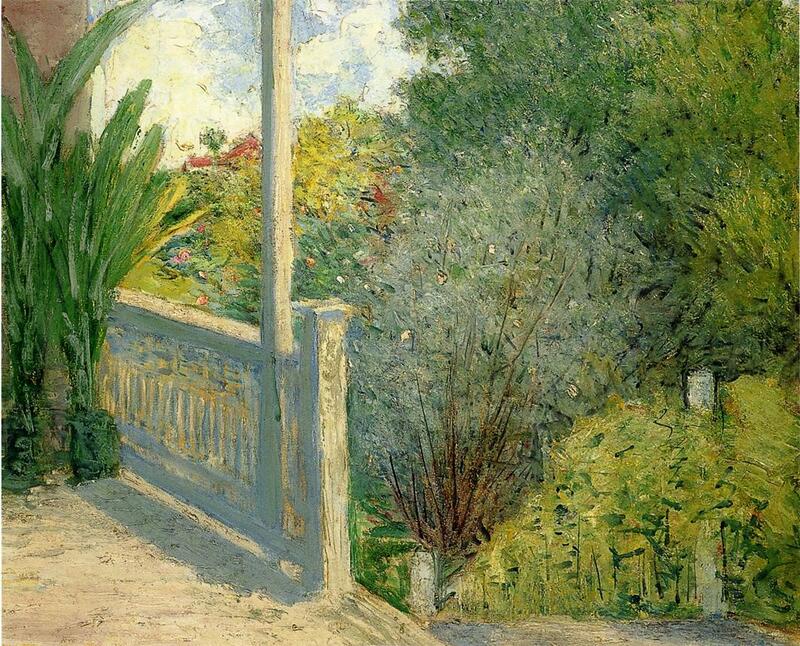 Julian Alden Weir, The Veranda (1900), oil on canvas, 63.5 x 76.2 cm, Private collection. WikiArt. 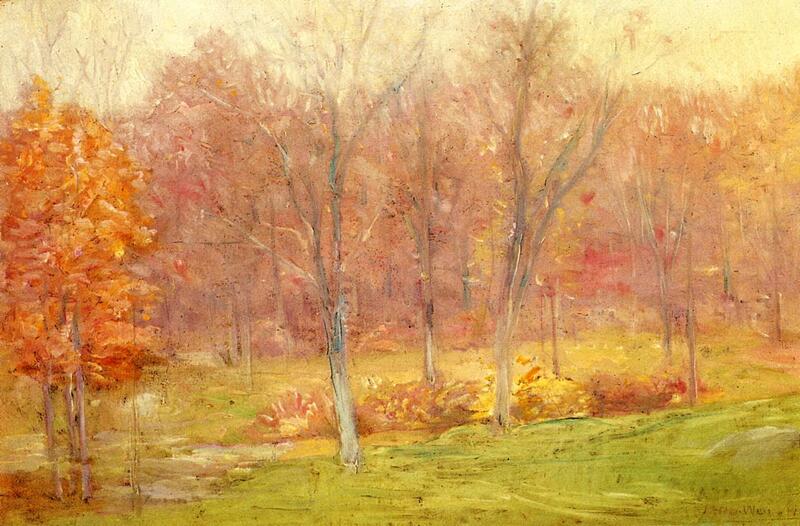 After 1900 his style tended to become less loose, and more realist again. In 1912 he was selected as the first president of the Association of American Painters and Sculptors, but resigned a year later in protest at its sponsorship of the infamous Armory Show of modernist work. He died in 1919. 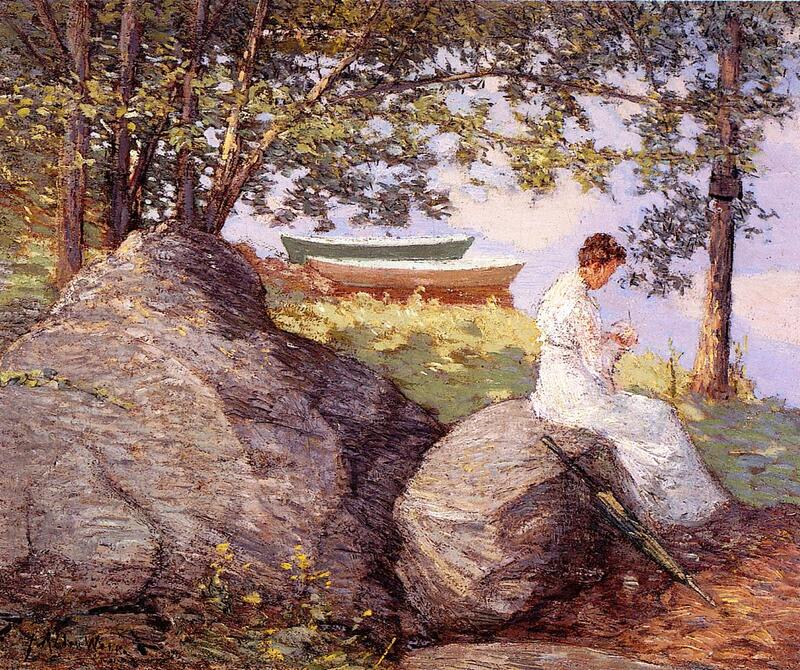 Julian Alden Weir, On the Shore (c 1909), oil on canvas, 63.5 x 76.2 cm, Private collection. WikiArt. Julian Alden Weir, The Lace Maker (1915), oil on canvas, 77.5 x 64.8 cm, Private collection. WikiArt. J Alden Weir’s style changed constantly through his working life. For the final decade of the nineteenth century he was an American Impressionist, and even after 1900 he maintained wonderfully loose brushwork. Posted in Painting and tagged Carolus-Duran, Chase, Cos Cob, Gérôme, Giverny, Impressionism, Monet, painting, Robinson, Sargent, Singer, Twachtman, USA, Weir, Whistler. Bookmark the permalink.